Take the guesswork out of your dissection kit ordering. Not sure what instruments to include your kit ? 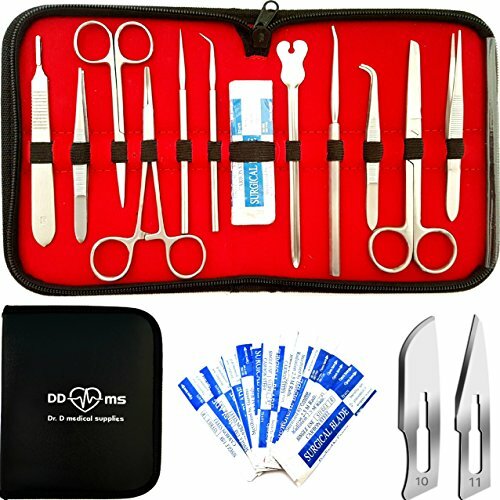 Dr. D Medical Supplies has done the work for you and is proud to present our 22-Piece Stainless Steel dissecting tool set. ►100% Made Of Durable Stainless Steel - Our kit contains only stainless steel tools - no chrome plating or plastic handles! ►Easy To Clean - All tools can be placed in a sterilizer, boiled and swabbed with alcohol without fear of damage. ►Complete & Comprehensive Set -The broad selection of dissection tools included in the set means you have the correct tool for every job, small or large, and can work efficiently while maximizing learning. ►Great Price - We sell these tools only in this complete set & not individually to keep the cost down; if bought separately, the set would list at over $47.00. ►100% SATISFACTION GUARANTEE - If for any reason you're not happy with your product let us know and we'll give you a full refund. We try to keep this product constantly in stock but sometimes we run out due to the high demand we experience. Click The Yellow Add To Cart Button At The Top Of This Page And Grab Your New Dissecting Set Now! If you have any questions about this product by Dr. D. Medical Supplies, contact us by completing and submitting the form below. If you are looking for a specif part number, please include it with your message.